Note: Our aim was to understand why and how companies move to the cloud, the major challenges of migration, the most successful utilization of talent, and overall success and satisfaction levels. One of the most significant challenges is finding skilled talent to support an enterprise cloud migration. Most organizations use a variety of internal, external and project-specific staff to implement their migration. The lead driver for cloud migration is data center consolidation and security-based. Despite the cost and challenges, cloud migration projects receive overall success and favorable satisfaction levels. 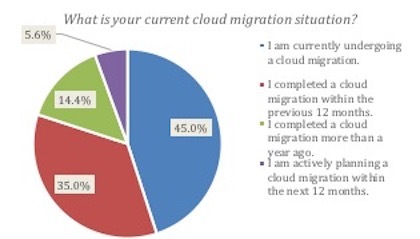 Survey results show that a majority of organizations have already completed, or are currently undergoing a cloud migration, with a downturn for future migration plans, suggesting the market will face a decline. 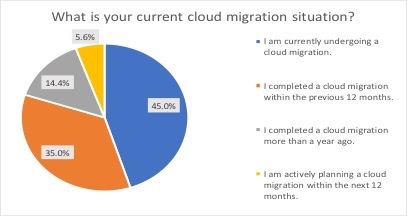 The majority of respondents, 45 percent, are currently amid cloud migration, while 35 percent have completed a migration within the last twelve months. This data shows that cloud migration in 2018/2019 was prevalent and front-of-mind for many verticles as organizations continue to optimize and scale their workforce and operations. 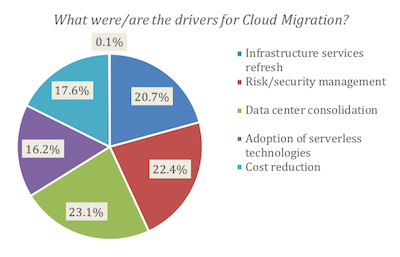 When polled about the primary drivers to migrate to cloud, respondents selected up to three choices. The most prevalent driver for cloud migration was data center consolidation, with 53 percent listing that as their primary motivation. Many factors corroborate this data. On-premise data-centers or servers are expensive and cumbersome to manage, not to mention can’t keep pace with current cloud technology in the ways of storage, network services scalability, and compute power. A close second was the need to bolster risk and security management of data and servers, with 52 percent. Moving away from on-premise solutions reduces the potential security breaches, offers disaster prevention, as well as multiple backup services. The third most popular incentive for cloud migration was an overall infrastructure services refresh, with 48 percent. Moving to cloud improves workplace productivity, increases collaboration, and maximizes system performance. Cloud hosting also increases options for robust application hosting. It’s also interesting to note, for companies with a higher number of servers – data center consolidation was the primary driver. Whereas, companies with fewer servers – infrastructure refresh and serverless technology were just as important. Selecting cloud providers is a complex process. Given that 32 percent have spent over $1 million and an average of 12 months on their cloud migration, decisions cannot be made lightly. However, as trends have shown, most organizations have unique needs that call for multi-cloud solutions. When considering vendors, most companies have chosen to use a mainstream provider—either single or dual with larger companies more so choosing dual providers. We believe this is also closely related to the size of the company and migration, with smaller migrations more likely to select a single provider. Further, our on-ground experience is also that the relative ‘ease’ of management is another factor favoring the choice of a single provider. As far as selection criteria, it’s a fairly even three-way tie. Most companies chose their provider based on (a) overall price, (b) provider reputation and trust, and (c) existing relationship - with price and trust as the slightly dominant choice. 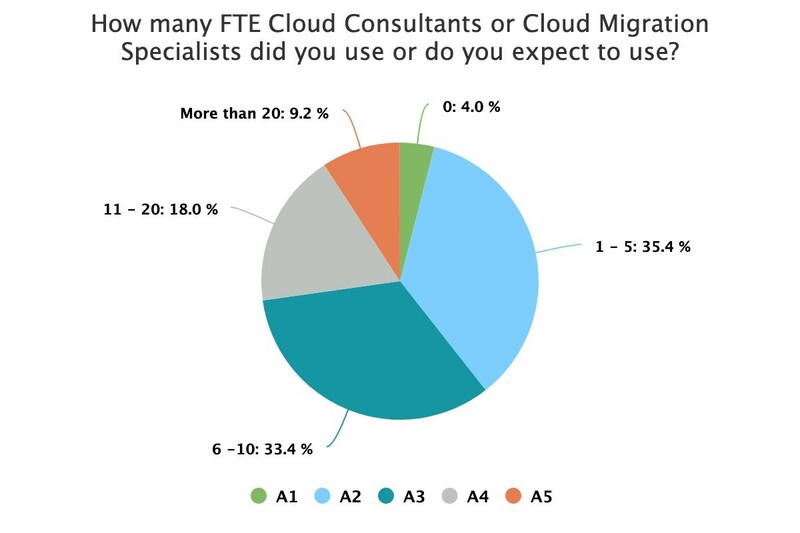 To further understand the actual issues companies encounter when migrating to cloud, we asked survey participants about migration pain points. Here, again, we allowed them to select multiple responses. Cloud migration is a lengthy, expensive, and complex process, which is precisely why 59 percent of survey respondents listed technology adoption as the most significant pain point with the process. While cloud environments are more secure than their predecessors, security and compliance concerns during the migration process remain the second highest concern, with 46 percent. The high demand and lack of qualified internal talent can be one of the most challenging hurdles for organizations to overcome, 40 percent listed the lack of skilled resources as one of their main challenges. (More information on the skills balance in the next section). It’s also interesting to note, that for companies with a higher number of servers—technology adoption was by far the most common pain point. Which corroborates a well-known fact in the IT industry, the larger the project, the more issues are bound to arise. When sourcing experienced cloud practitioners, companies use multiple tactics. The most popular method was to grow and use internal resources, with 56 percent of companies opting for that route. The second most prevalent sourcing option was to hire contractors for the duration of the project with 47 percent. Instead of going with individual contractors, 43 percent of companies augmented their internal resources with a third party company. Lastly, 29 percent hired new full-time staff with cloud migration experience. (We’ll dive into the success of those talent mixes in later sections). 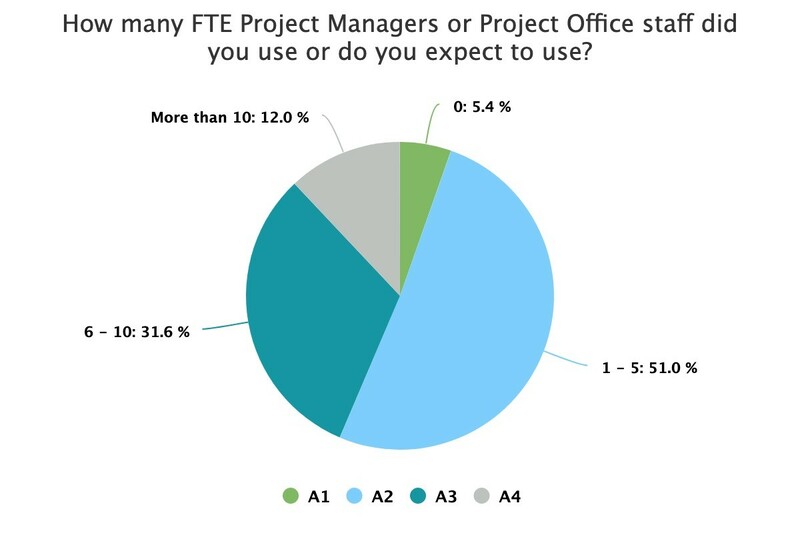 As far as the specific project teams that handled the migration, respondents discussed the size and skills mix of the full-time employees or equivalents (FTE) on their team that included employees, contractors, and third-party specialists. Particularly in the larger environments, there seems to be consistent use of internal resources—suggesting that companies feel more comfortable using internal resources for ongoing support. 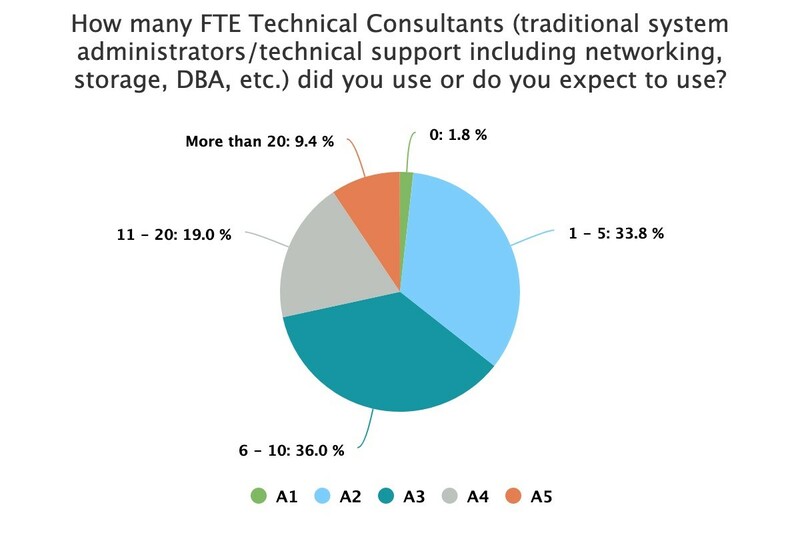 In our experience, the use of third-party resources is most common to assist or boost specific implementations, but companies prefer internal resources for long term support. We also frequently receive the feedback that companies are relishing the ‘time’ they reclaim from staff previously doing manually intensive support, and freeing them up for higher value work. Despite the challenges, 59 percent of respondents report that their project was on time, on budget with all objectives met. Even the 33 percent that had the project overrun time or projected budget still reported all objectives met. Only 8 percent had requirements that were not delivered. As far as satisfaction, 41 percent were moderately satisfied, and 37 percent were extremely satisfied with the outcome of their cloud migration. Less than 3 percent reported dissatisfaction with their outcomes. For dollar and cents, more than half of companies (53 percent) that participated in a cloud migrations experience an annual cost savings of 12 percent or more of their annual IT budget.There’s also something to be said for the relationship between the type of migration and the success rate. For example, rehosting projects are less complex and easier to achieve success, rather than those where an entire ‘re-architecture’ is required. To investigate the best options for talent usage during cloud migrations, we cross-referenced talent usages against success rates (measured by the project being on time, on budget with objectives met) and overall satisfaction levels (reported “extreme satisfaction” with project outcome). Enterprise Cloud Migration in the U.S.
GlassHouse view these survey results as an important bellwether for enterprise to mid-market customers considering migration to cloud. After overcoming the initial inertia, companies have embraced the cloud operating model. Our findings clearly support that cloud migration is well underway and customers are overcoming resourcing and skills gaps with engagement of specialist providers. Looking ahead we expect as the growth rates of migration plateau, customers will shift their focus to greenfield development initiatives in the cloud for the next generation of applications. Feel free to contact us to discuss how we can help you with choosing the right cloud migration strategy for your business. As a vendor independent consultancy, we deliver unbiased and customer-centric outcomes and are pleased to invest time to understand your requirements and needs as a business. In January 2019, we surveyed 500 professionals who’ve participated in an enterprise-level cloud migration with a full understanding of the scale and complexity of the process, from a business perspective. The respondents represented a diverse cross-section of industries including software, scientific or technical services, finance and insurance, information services and data, and telecommunications.